Piptadenia grata (Willd.) J.F. Macbr. 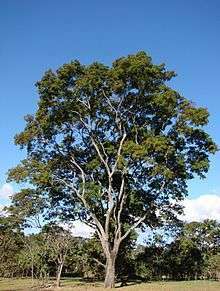 Anadenanthera colubrina (also known as vilca, huilco, huilca, wilco, willka, cebil, or angico) is a South American tree closely related to Yopo, or Anadenanthera peregrina. It grows from 5 m to 20 m tall and the trunk is very thorny. The leaves are mimosa-like, up to 30 cm in length and they fold up at night. In Chile, A. colubrina produces flowers from September to December and bean pods from September to July. 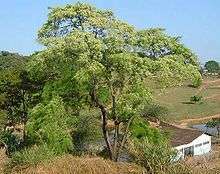 In Brazil A. colubrina has been given "high priority" conservation status. Anadenanthera colubrina is known by many names throughout South America. In Peru it is known as willka (also spelled wilca, vilca and huilca) which in the Quechua languages means "sacred". A. colubrina is found in Argentina, Bolivia, Brazil, Ecuador, Paraguay, Peru, Cuba, and Mauritius. A. colubrina grows at altitudes of about 315–2200 m with roughly 250–600 mm/year (10-24 in/yr) of precipitation and a mean temperature of 21 °C. It tends to grow on rocky hillsides in well-drained soil, often in the vicinity of rivers. It grows quickly at 1-1.5 m/year in good conditions. The growing areas are often "savannah to dry rainforest." Flowering can begin in as soon as two years after germination. A sweetened drink is made from the bark. Gum from the tree can be used in the same way as gum arabic. A. colubrina's tannin is used in industry to process animal hides. The beans of A. colubrina are used to make a snuff called vilca (sometimes called cebil). The bean pods are roasted to facilitate removal of the husk, followed by grinding with a mortar and pestle into a powder and mixed with a natural form of calcium hydroxide (lime) or calcium oxide. The main active constituent of vilca is bufotenin; to a much lesser degree DMT and 5-MeO-DMT are also present. A. colubrina has been found to contain up to 12.4% bufotenin. It is also believed that the beans used in snuff by the Incas. There have been reports of active use of vilca by Wichi shamans, under the name hatáj. Anadenanthera colubrina foliage and flowers. Anadenanthera colubrina leaves and bark at Iguazu Falls. The tree's bark is the most common part used medicinally. Gum from the tree is used medicinally to treat upper respiratory tract infections, as an expectorant and otherwise for cough. 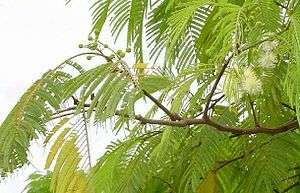 In northeastern Brazil, the tree is primarily used as timber and for making wooden implements. "It is used in construction and for making door and window frames, barrels, mooring masts, hedges, platforms, floors, agricultural implements and railway sleepers." The wood is also reportedly a preferred source of cooking fuel, since it makes a hot and long-lasting fire. It is widely used there in the making of fences, since termites seem not to like it. At one time, it was used in the construction of houses, but people are finding it more difficult to find suitable trees for that purpose. The bark and leaves contain tannin and the beans contain saponin. 1 2 3 4 5 6 Monteiro JM, de Almeida Cde F, de Albuquerque UP, de Lucena RF, Florentino AT, de Oliveira RL (2006). "Use and traditional management of Anadenanthera colubrina (Vell.) Brenan in the semi-arid region of northeastern Brazil". J Ethnobiol Ethnomed. 2: 6. doi:10.1186/1746-4269-2-6. PMC 1382198 . PMID 16420708. ↑ Diccionarios Botánicos Archived October 20, 2007, at the Wayback Machine. ↑ Angelo Z, Dante and Capriles, José M. La Importancia de las Plantas Psicotrópicas para la Economía de Intercambio y Relaciones de Interacción en el Altiplano sur Andino. Chungará (Arica). Volumen Especial, 2004. Pages 1023-1035. Chungara, Revista de Antropología Chilena. ISSN 0717-7356. 1 2 Desiccation and storage of Anadenanthera colubrina beans. Archived July 16, 2006, at the Wayback Machine. International Plant Genetic Resources Institute (IPGRI). Edilberto Rojas Espinoza. ↑ Ethnobotanica.org Anadenanthera spp. Archived September 30, 2007, at the Wayback Machine. ↑ Constantino Manuel Torres; David B. Repke. Anadenanthera: Visionary Plant of Ancient South America. p. 98. ↑ Ott J (2001). "Pharmañopo-psychonautics: human intranasal, sublingual, intrarectal, pulmonary and oral pharmacology of bufotenine". J Psychoactive Drugs. 33 (3): 273–81. doi:10.1080/02791072.2001.10400574. PMID 11718320. ↑ Ott, Jonathan (2001). Shamanic Snuffs or Enthogenic Errhines. EthnoBotanica. p. 90. ISBN 1-888755-02-4. ↑ Medicina traditional Ergebnisse einethnomedizinischen ...(German) Archived February 5, 2012, at the Wayback Machine. ↑ Peter Stafford; Jeremy Bigwood (1993). Psychedelics Encyclopedia. Ronin Publishing. pp. 420 pages. ISBN 0-914171-51-8. Rätsch, Christian; Schultes, Richard Evans; Hofmann, Albert (2001). Plants of the gods: their sacred, healing, and hallucinogenic powers. Rochester, Vt: Healing Arts Press. ISBN 0-89281-979-0. Pachter IJ, Zacharias DE, Ribeiro O (1959). "Indole Alkaloids of Acer saccharinum (the Silver Maple), Dictyloma incanescens, Piptadenia columbrina, and Mimosa hostilis". J. Org. Chem. 24 (9): 1285. doi:10.1021/jo01091a032. Wikimedia Commons has media related to Anadenanthera colubrina.